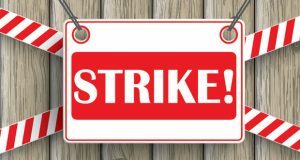 The wave of strike actions blowing across Nigeria seems set to continue as federal civil servants in the country have resolved to embark on strike effective from Monday, 18th September, 2017. The workers, under the auspices of Association of Senior Civil Servants of Nigeria (ASCSN) has resolved to shut down the government unless the debts owed them are paid on or before Monday 18th September 2017. The workers are reacting to the federal government’s refusal to pay promotion arrears, outstanding salaries, and other allowances owed federal officers despite various promises by the government to do so, LEADERSHIP reports. In a press statement issued in Lagos yesterday, ASCSN secretary-general, Comrade Alade Bashir Lawal, disclosed their intention to proceed on strike. “It is rather unfortunate that the same federal government that has given state governments bailouts up to three times to settle the entitlements owed their workers, takes delight in punishing its own employees by denying them their legitimate benefits,” the Union stated. “Although the federal government had issued two different circulars directing the MDA’s to compile the names of their staff that are affected which they did, yet, no payment was made. “Even when the government directed the Budget Office to raise virement last year for the payment of the outstanding entitlements, there was no cash backing until the virement lapsed,” the Union lamented. “In view of the foregoing, the Association of Senior Civil Servants of Nigeria has given the Federal Government a 7-day ultimatum with effect from 8th September 2017 within which to settle all the debts owed Federal officers failing which a 3-day warning strike will start in all the Federal MDA’s throughout the country,” the Union emphasized. According to the ASCSN, the debts owed federal officers by the federal government include outstanding salaries, promotion arrears, 1st 28days allowance on transfer from post, mandatory training allowance of OHCSF 2010, repatriation allowances, burial expenses, and death benefits.